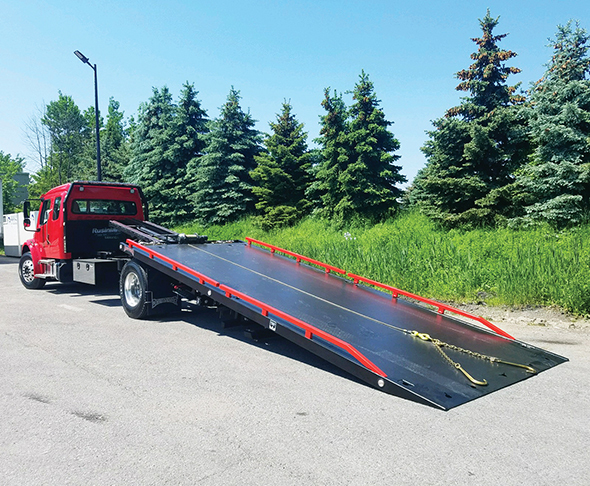 The Devastator by Detroit Wrecker is the newest roll back to hit the market. A standard carrier that is built like a tank. Sandblasted and powder coated. Featuring the best pivot pin system that money can buy. You can tighten your pivot points. Bronze Oil-Lite bushings at every pivot point. Lifetime warranty on pins and bushings, with proper maintenance. No plastic wear pads inside our wheel-lifts. 3’ bed locks that translate to 19’ beds turning into 21’ beds when needed. Custom logo in pylon. Call 313-835-8700 or visit www.detroitwrecker.com.